Born in Baltimore, Maryland, artist Williams spent his childhood days in an idyllic setting surrounded by lush landscapes and vibrant scenery. It was here that Williams believes he first became aware of the relationship between shapes and colour and the variations of light and shadow found everywhere in his world. 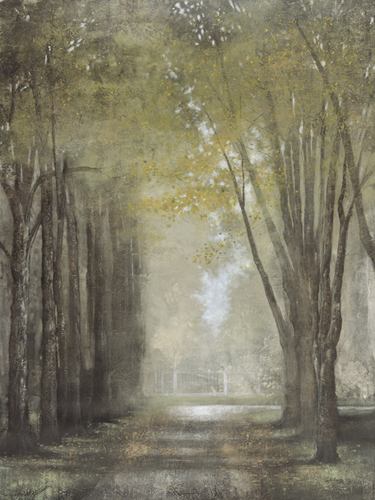 It is this keen eye, developed at an early age, that led Williams to study his surroundings and refine techniques for depicting what he saw, resulting in the exquisitely subtle landscapes, filled with mysterious light, that are the hallmark of his work today. After high school, Williams was awarded a Bachelor of Fine Arts from university in Arizona. He continued his pursuit of technique, studying the work of artists like Camille Corot and George Iness whose paintings, he believes, contain an emotional and spiritual impact capable of capturing the viewer and evoking their deepest emotions. Greatly influenced by the luminous style of the Barbizon school, the paintings of artist Williams are dreamscapes of shadow worlds that are a perfect blending of the artist’s imagination with the subtleties of nature that he knows so well. Whether his landscapes are filled with blazing red trees reflected in scarlet waters, or brooding night skies obscuring a cold and translucent moon, the paintings of artist Williams are at once whimsical and serene. When he is not painting, Williams likes to study the techniques of other artists that he finds in magazines or in the library in order to “try something new” and to experiment with these innovations in his home studio. “I believe experimentation in art is the best way to experience something common, like nature, in an uncommon manner. I try to evoke mood and atmosphere in my art, something that brings emotion.” Williams devotes his free time to his wife and newborn son, who he describes as the greatest inspiration for all his work.